West Coast style has migrated to the Prairies at Harvest Townhomes, designed and contructed by Arbutus Properties in its popular community, The Meadows, part of the southeast Rosewood subdivision. The Harvest Townhomes development is comprised of three-storey townhomes with colourful Craftsman exteriors and attached garages. “Three-storey townhomes, all above ground, are prevalent on the West Coast, but not as common here,” says Jody Minakakis, sales manager with Arbutus is Saskatoon. Minakakis says the project’s first phase is nearing completion, with two more phases to follow. When fully built out, Harvest Townhomes will comprise more than 225 units. Arbutus has unveiled several new floor plans at Harvest Townhomes, including its new show home located at 619 Meadows Blvd. Potential buyers can select from two-bedroom, three-bedroom and three-bedroom-plus-den layouts, with units ranging in size from 1,190 to more than 1,600 square feet. There are currently six variations of floor plans to choose from. We wanted to offer something for every demographic, from young professionals to families to empty nesters. We are one of the few townhome projects around that includes units with three bedrooms plus a den on the ground floor. The den could be utilized as a fourth bedroom or a home office,” says Minakakis. The new show home at Harvest Townhomes is bright and spacious, starting with a private entrance and large foyer on the ground floor. The open concept living room, kitchen and dining area occupies the second floor; bedrooms and laundry room are on the third floor. Large triple-glazed windows maximize the natural light that flows through the home. “As is typical with all Arbutus homes, we do as many windows as we can, as large as we can,” says Minakakis. 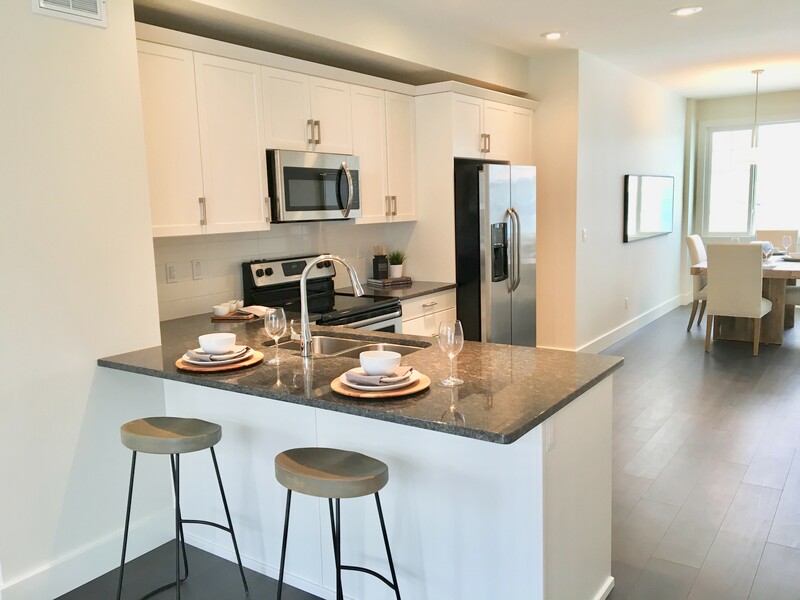 Arbutus has carefully researched the materials and finishes selected for Harvest Townhomes to ensure style and durability, including granite or quartz countertops, Torlys Marquis laminate wide plan wood-grain flooring in the great rooms and ceramic tile flooring in the bathrooms and foyers. Arbutus’ design consultant Jen Lapsiuk has developed two different colour palettes for the Harvest Townhomes: espresso and white. “One’s more contemporary, the other is a little bit more traditional. We want to be able to offer something for everyone,” says Minakakis. Minakakis says that Arbutus isn’t just building a townhome project on the site – they’re redeveloping a community with amenities designed to bring neighbours together. A unique rain garden has also been installed along the perimeter of Harvest Townhomes, which Minakakis says is a first in Saskatoon. 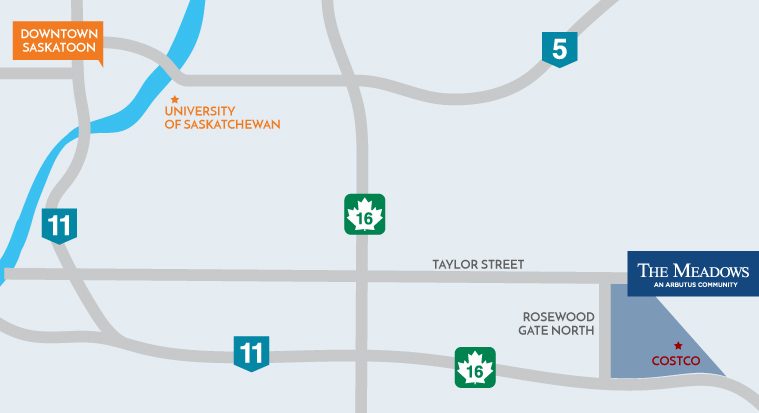 The feature which was developed in consultation with the University of Saskatchewan, is a green solution for stormwater management. Native plant species that thrive in the wetter soil have been planted in the raingarden, which serves as a collection basin for rain water from lawns, pavement and other hard surfaces. Harvest Townhomes are priced starting at $289,900. Condo fees are also being kept affordable, ranging from $179 to $221 per month, including water usage. Arbutus Properties has also introduced a special promotion at Harvest Townhomes. “If you purchase and move in by December 1, you will receive $2,000 in Meadows Market gift cards,” says Minakakis. Meadows Market, which is across from Costco, features an exciting mix of retailers and services, including the city’s first Marshalls, PetSmart, Co-op Wine Spirits and Beer, Scotiabank, a Tim Hortons, McDonald’s and more. Two show homes are open for viewing at Harvest Townhomes, at 619 and 703 Meadows Blvd., open Wednesdays from 4 p.m. to 8 p.m., and Saturdays and Sundays from 1 p.m. to 5 p.m.